Last edited by Macdoc on Jun 15, 2018 6:09 pm, edited 1 time in total. 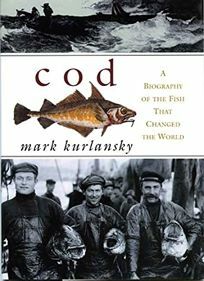 Kurlansky wrote the one about cod, this is by Greenburg a fellow Lower East Sider. Free as a cow in a verdant meadow etc...moot semantics no? The opposite of wild is domesticated. You can hold a zebra captive but it's still wild. Generally also domesticated can't survive in the wild ....this is a concern with farmed salmon that escape. Some domesticated animals..horses, goats can revert to wild. Others cannot ....a dairy cow ain't gonna last a week. Yeah. You could be right. But it would be an 'interesting' experiment to get a local herd of cows and let them loose with a bull. Would instinct kick in, I wonder? For non-dairy cows...yes they could re--wild but dairy cows must be milked or they die quickly. Beef cattle re-wilds quickly ....reading about the bull catchers in outback Australia is very interesting as a couple of generations can go by before they are brought to market and they are definitely wild animals at that point. There are lots that can do well, camels in the wild in Australia are now exported to Arabia as the wild stock is stronger, domesticated water buffalo are thriving ( and bloody dangerous ) in tropical Australia. Even chickens might survive but wing to weight dictates against it. Dogs just go feral and eat each other....cats ditto...never really domesticated in the first place. Many wild animals like foxes and coyotes and raccoons are actually thriving urban or ex-urban environments. ...but dairy cows must be milked or they die quickly. I know little of animal husbandry but I can see why. How did they get to this state? Selective breeding? I thought perhaps 'once a cow always a cow...' (Well, up to a point). Chickens revert to a wild state in several places. Key West is famous for them. Gigi, a nine-year-old Holstein cow, who spends her days grazing at Bur-Wall Holsteins in Brooklyn, Wisconsin, has broken a U.S. record for milk production, churning out 74,650 pounds of milk in a 365-day period. They die quickly if not milked twice a day. 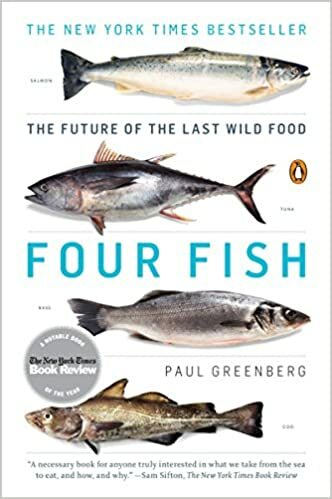 Four Fish .....very enjoyable ...I now know hellishly more about the challenges facing us with regard to farming and preserving fish stocks and the incredible progress of some segments ....and dismal death spirals of others. All done in a folksy, personal experience style that crams you full of useful knowledge. Recommended highly. Seems like I'll have to breakdown and buy COD at full price. Try ABEbooks for a used copy of Cod.